Most people, when they decide they and their spouse are no longer compatible, simply want to make a clean break, going through a divorce and moving on. However, some couples remain on the proverbial fence. 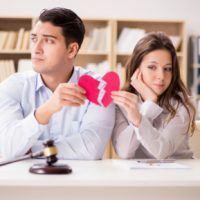 If you and your spouse are in this situation, you may wish to try what some Nevada couples do and try a legal separation. For some couples, a separation gives them all the advantages that would be gotten in a divorce with very few of the disadvantages. Either way, it may be worth investigating before deciding to proceed with a divorce action. Why Separation & Not Divorce? On the face of it, anyone choosing legal separation, called Separate Maintenance in Nevada, over the clean break of a divorce would seem to be missing the point. Significant numbers of spouses choose to divorce because they want to be both physically and legally free of their partner, and be more able to make their own decisions. However, sometimes divorce is simply not tenable or desirable, for a host of different reasons, and it is not as unusual to see couples remain separated but married for decades, even until one of them passes away. Many couples remain separated due to religious reasons – certain faiths do not permit divorce, only annulment, which is not possible for everyone to get. Other reasons are financial – especially in this somewhat uncertain political climate, the issue of health insurance has become vital for many, and a divorce removes your spouse from your health insurance, it may be a literal matter of life and death to do so, if your spouse is ill. Many couples will actually include such a provision in their separation agreements. If you and your spouse decide to try a legal separation in Nevada, the first thing to understand is that Nevada law permits a possessory severing of all assets and interests only, but you will still remain legally married. Indeed, the law states that actions for separate maintenance must be conducted with as close to the same “procedures and practices” as divorce actions. The law also provides authority for the parties to a separation agreement (or the court) to handle matters related to child custody, support or any issue regarding parenting time. It is also worth noting that property acquired after the entry of the separation agreement may be classed as separate property, as it would in a divorce action, and the same goes for any incurred debts. It is not uncommon for spouses and to plan as though any new debts incurred in particular will be jointly owed by both spouses. If this does happen, it may bring up issues in bankruptcy law, because separated spouses are still married, and as such, under a Chapter 7 or 13 bankruptcy, would still be on the proverbial hook for each other’s debts. While it is not the right choice for everyone, sometimes a legal separation can actually serve your interests better than divorce. Before making a move, however, it is best to contact a knowledgeable lawyer familiar with the field. The Las Vegas separation attorneys at the Kainen Law Group are happy to work with you in figuring out what is the best course of action for you and yours. Contact us today to schedule a free consultation.